The following are steps we suggest to help you quickly made an educated choice about water purifiers , filters & ionizers. If you have any further questions you are warmly invited to Contact Us. We do not use sales pressure and treat all information with complete confidence. Why water ionizer & purifier instead of bottled water or other water purification methods? Dangers of using Plastic discussed Here and Here. AlkaViva is the oldest direct importer in the USA. Between our two founding partners you get over 30 years of USA-specific water ionizer industry expertise. Virtually all our USA competitors started with us as dealers including Life IonizersTM, Tyent, Echo and Chanson. We have helped develop and launch major new water ionization technology that have been emulated by many others, such as MESH electrodes/plates and MARC/DARC improved electrode cleaning systems. We have been instrumental in launching and supplying water ionization components for commercial applications. Most notably, we supply Tennant Company, water cells for their Ec-H2O floor cleaning product line. Ec-H2O was the first commercially successful application of water ionization technology and has won numerous international awards. Together, our OEM partners offer 69 years of water ionizer manufacturing and are the largest in South Korea . They both hold ISO 9001 and 14001 certifications, own patents too numerous to list, and have won many awards for their business practices and products. Both are firmly rooted in ongoing research and development and in quality management practices. we focus in water filtration power, technology , sophistication & design(i.e. :SMART electrodes & DARC II electrode cleaning systems,AutoAdjust optimal performance with low power ), manufacturing quality and durability. Our unique focus is on the importance of clean water. AlkaViva’s UltraWater filter performance (and testing ) is unique . 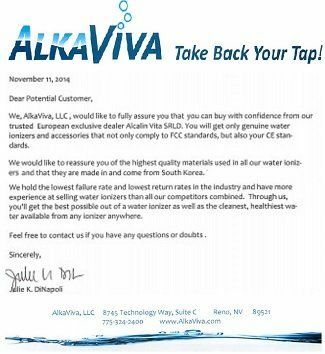 We are the only company who represents two top manufacturers offering water ionizer models that fill different niches. We offer you the best of the best – in water filtration, water ionizer performance, electrodes , electrode cleaning system & durability and customer experience. That is choice. That is smart. AlkaViva(IonWays) / EmcoTech(Jupiter Science) water ionizers & purifiers (filters)are certified medical devices ,are approved by Korea FDA and by Japanese Health Ministry AlkaViva(IonWays) / EmcoTech(Jupiter Science) water ionizers & purifiers (filters) are approved by multiple countries’ Health Departments AlkaViva(IonWays) / EmcoTech(Jupiter Science) water ionizers & purifiers (filters) have been ENDORSED by New York Best Selling Authors, Dr. Robert O. Young, author of “The pH Miracle”, and Dr. Ben Johnson author of “The Healing Codes”. AlkaViva(IonWays) / EmcoTech(Jupiter Science) water ionizers & purifiers (filters) are the choice for Dr. Ted Baroody, notable author of “Alkalize or Die” and Sang Whang, scientist and author of, “Reverse Aging”. 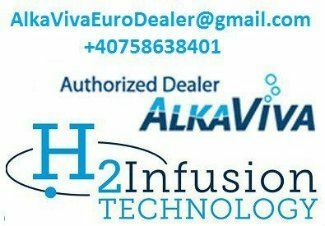 AlkaViva(IonWays) / EmcoTech(Jupiter Science) water ionizers & purifiers (filters) have been chosen for a variety of ionized water applications by professional athletes, physicians, embassies, health practitioners, hospitals, commercial companies, horticulturists, executive chefs, alternative health centers, and more. What water ionizer & purifier (filter) model do I choose? AlkaViva(ex IonWays) was recently featured in a fantastic PBS documentary. To see the American Health Journal , documentary on ionized alkaline water, uincluding scenes from Vilcabamba Ecuador.